Are you thinking about switching to propane? 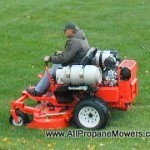 I was introduced to propane engine technology at the GIE Expo in 2007. As I learned more about propane engine technology, I became 100% convinced that this low polluting, money saving fuel option would one day be “the engine fuel of choice for the green industry”. In early 2008 I began demonstrating propane mowers at events for Clean Cities, The Propane Education & Research Council (PERC), propane marketers and commercial lawn equipment dealers to help promote the use of propane engine fuel, also known as autogas. Over the years since then, I have had the privilege of working with some of the innovators of propane engine technology and have visited with municipalities, colleges, universities and landscape contractors to share my knowledge of propane powered equipment. Now propane engine technology is really catching on. The days of experimentation are over. What does it take to bring propane power into the mainstream? How can landscape contractors and fleet managers find resources? How do propane retailers, equipment dealers and conversion centers connect with end users who are thinking about switching to propane? Detailed information and product reviews on propane powered equipment, fleet vehicles and engine conversion options. New innovations in propane engine technology. Information on grants, tax incentives and other programs both nationally and locally that will assist in the purchase new equipment and vehicles or conversions for your existing fleet. Articles that demonstrate the successful use of propane as an engine fuel in green industry equipment and fleet vehicles. Listings for propane companies, equipment dealers and conversion centers in your state that are ready to work together to serve you. Highlights on companies that are succeeding in the propane engine fuel market. Your questions answered by our growing panel of experts in the field of propane engine technology. Your experience, product reviews, information on local resources, grants, incentives and more can help others make an informed decision to switch to propane. Are you a pioneer in the world of propane powered lawn & garden equipment and fleet vehicles?